Business Intelligence ensures that the right information reaches the right person at the right time. At least, that’s the intention. If that can be achieved, you’re already a step ahead. However, the real work is yet to begin: influencing the behavior of customers, managers, and employees based on essential information and insights. 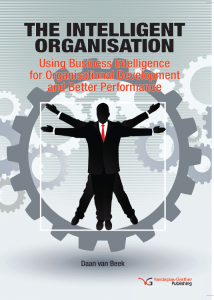 We can only speak of successful Business Intelligence when that is the case. Why is behavior so important? The graphs below, from a toy wholesaler, shows the percentage of orders outside of the standard packaging unit of a specific store for a period of thirteen months. The toy cars are packaged per ten units in the warehouse, and the store orders nine units every month. Orders like this, which fall outside of the standard packaging unit, cost the organization a lot of money: warehouse employees have to repackage. The wholesaler would prefer if the store manager ordered nine times ten units over ten months rather than nine units for ten months in a row. Another example. A car damage insurer benefits from customers who cause as little damage as possible. To gain insight into this, the stakeholders developed an indicator (damages per customer – deductible). When this indicator is over 100%, the insurer takes a loss on the contract and will have to consider taking action. The above examples clarify that business intelligence and behavior have a lot to do with each other. In the implementation of business intelligence, this link is rarely discussed, despite how important it is. The goal should be to realize a change in behavior in your customers in order to improve your performance (management), preferably permanently. To that end, smart managers have indicators like this on their dashboard, with the goal of analyzing management information where necessary, and using it to enter into a conversation with employees and customers (relationship management). Is the information used consistently for analysis, improvement, and focused action? Are employees and managers confronted with both positive and negative performance and developments? How are you doing that? Which competencies do smart managers need? How is customer behavior monitored, and how is this communicated internally and to the customer? In that light, it may not be a bad idea to examine the skills and competencies in your organization. Because if there are shortcomings in this area, a focused training course can be a simple and highly effective way to get more out of your current and future business intelligence investments. Do you want to take a training course or workshop in this area? Take a look at Continuous Improvement training course for more information. We love to help you getting started with put behavior on the bi agenda in 2019.